Palm Armchair with slipcovers and optional down-filled cushions. Slip covers are the best way to protect your furniture investment -- especially if you are planning to rent. Each Chair is handmade. All are made with a very durable off white 100% cotton that is pre-washed and pre-shrunk and can be washed over and over again and still look brand new. The cushions are hand-upholstered with high density silicon materials and the assembly is made with stainless-steel springs. If you want a different fabric please contact us for current options. 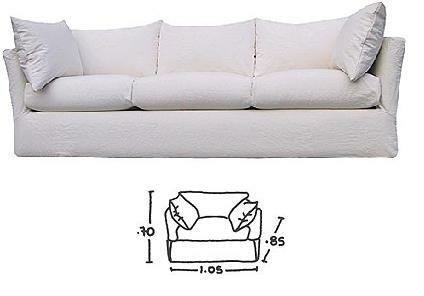 Optional down cushions are filled with Dupont Down Feathers specifically made for Mexico warm-weather climates.